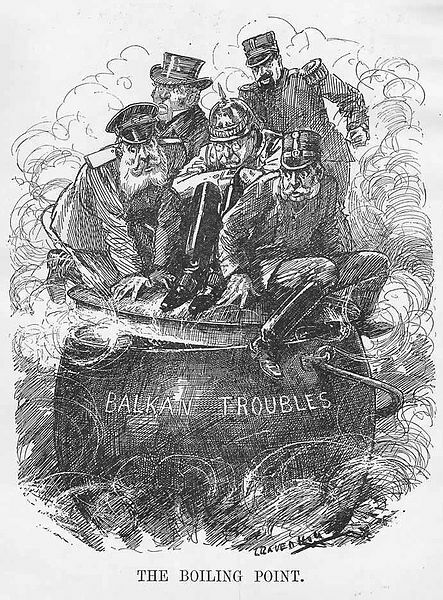 The immediate trigger that led to the start of the Great War (or First World War as it was subsequently known) was, relatively, innocuous enough – another assassination in the volatile Balkans. However what followed quickly resolved itself into a direct causal sequence of mobilisations & declarations of war by all the major European countries in turn – like a line of toppling dominoes. To those Britons living through it, it must’ve been like watching a car crash approaching in slow motion : Something you couldn’t take your eyes off – a disaster driving forward engulfing all the innocent bystanders as it headed your way. The immediate cause of the outbreak of the First World War was the assassination of the Archduke Franz Ferdinand, heir to the throne of Austria-Hungary, on 28 June 1914. The assassination took place in Sarajevo, the capital of Bosnia, a province in the Balkans that had been annexed by Austria-Hungary. The Archduke was visiting Sarajevo with his wife inspecting troops. The nineteen-year-old student. Gavrilo Princip, who shot the Archduke, was a Serbian but he was not an agent of the Serbian government, who knew nothing about the plot. Nevertheless, it was the Serbian government that Austria-Hungary blamed. Austria-Hungary wanted military revenge but was conscious that Russia might not stand idly by if the Austro-Hungarian army invaded Serbia. The Russians would see an invasion of Serbia as a potential first step to an invasion of Russia itself. Count Berchtold, the foreign minister of Austria-Hungary therefore questioned their ally, Germany, as to what their reaction would be. The next day, the Kaiser told the Austrian ambassador to Germany that if war between Austria-Hungary and Russia become unavoidable, Austria-Hungary could rely on German support. On the 23 July 1914, Austria-Hungary delivered an ultimatum to Serbia. It contained demands that Serbia was bound to reject. Austria-Hungary knew this and mobilised. In Fact, Serbia accepted most of the demands but, by this time, Austria-Hungary was determined on war. On 28 July, Austria-Hungary declared war on Serbia. The Russian Empire, unwilling to allow Austria-Hungary to eliminate its influence in the Balkans, and in support of its long-time Serb protege, ordered a partial mobilisation one day later, 29 July. Germany mobilised on 30 July, and Russia responded by declaring a full mobilisation that same day. Germany then imposed an ultimatum on Russia, through its ambassador in Berlin, to demobilise within 12 hours or face war. Russia responded by offering to negotiate the terms of a demobilisation. However, Germany refused to negotiate, declaring war against Russia on 1 August 1914. Aware of the alliance between France and Germany and concerned about a war on two fronts (East & West), the German government, simultaneously with its mobilisation against Russia, issued demands that France remain neutral. The French cabinet resisted military pressure to commence immediate mobilisation, and ordered its troops to withdraw 10 km (6 mi) from the border to avoid any incident. Germany attacked Luxembourg on 2 August, and on 3rd August declared war on France. On 4 August, after Belgium refused to permit German troops to cross its borders into France, Germany declared war on Belgium as well. Thus in short succession 5 major European powers found themselves at war. A war the like of which the world had never seen before. Millions of men had been mobilised and armed with the latest weaponry made to kill on an industrialsed scale. HOW DID THE DOMINOES GET SET UP IN THE FIRST PLACE? The many tensions and events that led up to the European powder keg that exploded with the Archdukes assasination were extremely complex. We’ve listed some of the most pertinant here. The truth was that there were many countries and population groups unhappy with existing conditions. Austria-Hungary was an empire in decline, with many unhappy inhabitants who wanted freedom, and the same was true in the Ottoman (or Turkish) empire. The German and Russian rulers were also concerned about the dissatisfaction of their ethnic minorities. All three empires were faced by demands for more democracy, or, in Russia’s case, for any democracy at all. By European standards, Russia was a backward country, especially as far as government was concerned. The wealthy still had all the power, and the state was run by a dictatorial emperor or Tsar, answerable to no one. Germany had become a strong, inventive, industrialised country with an efficient and disciplined workforce. Growth and expansion, especially to the east became a popular cry. If they were going to expand eastwards, Russia was going to he the loser. In Italy, there were those who wanted to take territory from Austria-Hungary and to control the Adriatic Sea. In France, many wanted recovery of the provinces of Alsace and Lorraine, lost to the Germans in the Franco-Prussian war of 1870-71. The war hade been engineered by Bismark to help complete his unification of Germany. The war had been particulary hard on the French so the thirst for revenge was palpalable. In Turkey, there was deep suspicion of Russia. In Russia, there was support for the Slavs of Serbia, Romania and Bulgaria against Austria-Hungary. In Germany, there were those who wanted to expand eastwards into Russian territory, which the Russians were aware of. Add to these various instabilities the characters of the leading rulers, whether royal or parliamentary, and it is easier to see why the atmosphere became suddenly explosive. For example, the German Kaiser Wilhelm II, a grandson of Queen Victoria, suffered from a withered arm and a massive inferiority complex. He was by all accounts coarse and abrasive. His uncle, King Edward VII, treated him with jovial contempt whilst his cousin Tsar Alexander III disliked his ‘aggressive amiability’ and distrusted him. Of more significance was Wilhelm’s falling out with the British. As Britain’s expansion in southern Africa frustrated German ambitions, Wilhelm gave encouragement to the Transvaal Boers and suggested that Germany should declare a protectorate over the Transvaal and send troops. It was at this point that the Kaiser realised that Germany could not take on Britain at sea, and began the expansion of the German navy. 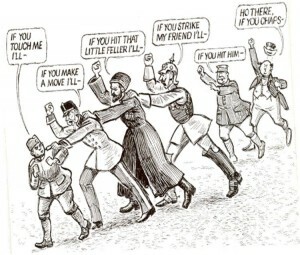 Wilhelm’s aggressive approach was matched in Britain. This may be seen as a symptom of the other issues but the fact remains that in the last twenty years of the 19th century the naval and military expenditure of the major powers had doubled and, in the first decade of the 20th century, it doubled again. Coupled with militaristic nature of Prussian society and the fact that rulers of 3 of the countries were autocrats – not accountable to their people – it meant that these powerful war machines could be used on a whim. The German military comanders were particularly belligerent, after all – armies like wars. That’s what they are created for. Between October 1912 and July 1913 two Balkan wars were fought between Turkey, Montenegro, Greece, Serbia, Bulgaria and Romania. All laying claim to or defending territory. It was chaos, with everyone becoming more mobilised and ready for war. With all this insecurity and belligerence, every country indulged in warlike speeches and articles throughout 1913 and into 1914. The atmosphere was such that the assassination of the Archduke Franz Ferdinand had a very good chance of provoking a general war, and that was exactly what happened. In the 19th century, the major European powers had gone to great lengths to maintain a balance of power throughout Europe, resulting in the existence of a complex network of political and military alliances throughout the continent by 1900. It all started in 1815, with the Holy Alliance between Prussia, Russia, and Austria. Then, in October 1873, German Chancellor Otto von Bismarck negotiated the League of the Three Emperors between the monarchs of Austria-Hungary, Russia and Germany. This agreement failed because Austria-Hungary and Russia could not agree over Balkan policy, leaving Germany and Austria-Hungary in an alliance formed in 1879, called the Dual Alliance. This was seen as a method of countering Russian influence in the Balkans as the Ottoman Empire continued to weaken.In 1882, this alliance was expanded to include Italy in what became the Triple Alliance. Bismarck had especially worked to hold Russia at Germany’s side to avoid a two-front war with France and Russia. However when Wilhelm II ascended to the throne as German Emperor (Kaiser), Bismarck was compelled to retire and his system of alliances was gradually de-emphasised. In 1892, the Franco-Russian Alliance was signed to counteract the force of the Triple Alliance. In 1904, Britain signed a series of agreements with France, the Entente Cordiale, and in 1907, Britain and Russia signed the Anglo-Russian Convention. While these agreements did not formally ally Britain with France or Russia, they made British entry into any future conflict involving France or Russia a possibility, and the system of interlocking bilateral agreements became known as the Triple Entente. Thus an intricate web of alliances was in place by 1914 so that pulling on one of the strands would radiate out to affect all the countries ensnared by the web. 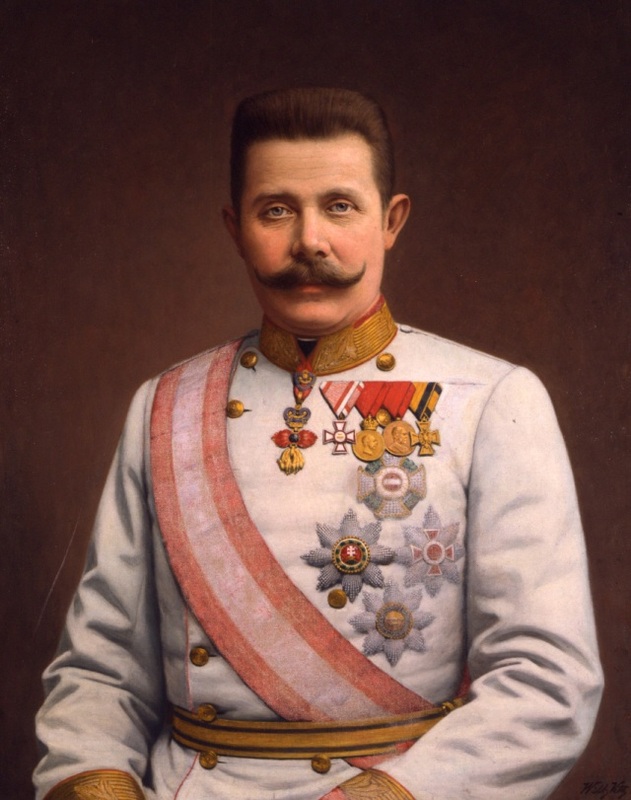 June 28 Archduke Franz Ferdinand, heir to the throne of the Austro-Hungarian Empire, and his wife Sophie, Duchess of Hohenberg, are assassinated in Sarajevo, Bosnia. June 29 Secretary of the Austro-Hungarian Legation at Belgrade sends despatch to Vienna accusing Serbian complicity in the assassination. July 20 Austria-Hungary sends troops to the Serbian frontier. July 25 Serbia orders mobilisation of troops. Russia arranges for troops to be stationed on Russo-Austrian frontier. July 29 Great Britain warns Germany that it cannot remain neutral. Austrians bombard Serbian capital Belgrade. German patrols cross the French border. August 1 French military mobilisation ordered. Germany declares war on Russia. Italy announces neutrality. Belgium announces neutrality. August 3 Germany declares war on France. Great Britain gives order for troops to mobilise. August 6 Royal Navy cruiser HMS Amphion is sunk by German mines in the North Sea, causing the death of 150 men and the first British casualties of war. August 7 First members of the British Expeditionary Force (BEF) land in France. August 11 ‘Your King and Country Need You’ slogan is published, calling for the first 100,000 men to enlist for Kitchener’s New Army. The call is answered within two weeks. August 13 The first squadrons of the Royal Flying Corps arrive in France. August 20 Brussels is evacuated as Germans occupy the city. August 25 The Royal Flying Corps claim their first ‘kill’ as three aircraft from 2nd Squadron force down a German reconnaissance plane. August 26 The Battle of Le Cateau. BEF suffers 7,812 casualties and is forced to retreat. Sept 6 The First Battle of Marne checks German advance at the cost of 13,000 British, 250,000 French and 250,000 German casualties. Oct 16 The British Indian Expeditionary Force sails from Bombay to the Persian Gulf in preparation for the defense of Mesopotamia. 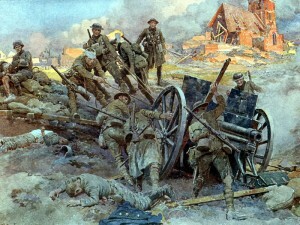 Oct 19 First Battle of Ypres. Oct 29 Turkey enters the war. Nov 22 Trenches are established along the entire Western Front. Nov 23 The British enter Basra, securing oil supplies in the Middle East needed to supply most of the Royal Navy. Dec 8 The Battle of the Falkland Islands. A Royal navy task force sinks three German cruisers that were victorious at the Battle of Coronel in Nov. Only the SMS Dresden escapes. Dec 16 The German First High Sea fleet bombards Hartlepool, Whitby and Scarborough, killing 137 civilians and proving that the British mainland is susceptible to attack.